As it's the second Monday of the new year, I thought I would share a delicious salad recipe that I recently made. If you're like me, I'm always trying to find new salads to throw together because I quickly tire of throwing some baby spinach and cut veggies together and calling it lunch. 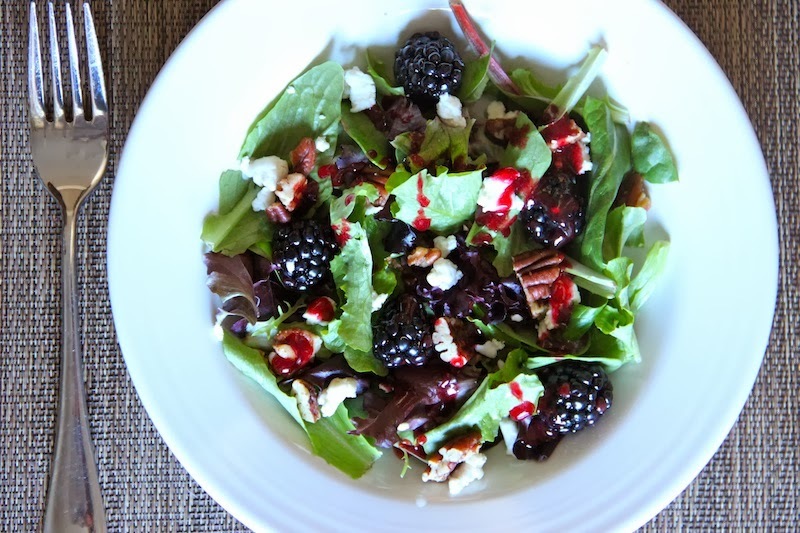 This salad uses fresh blackberries, honey goat cheese, and delicious spiced nuts, and is served with a homemade blackberry vinaigrette that brings the entire salad together. To make the dressing, place the berries in a food processor and puree until smooth. Pour the mixture through a fine mesh sieve, pressing out as much fruit puree as possible while removing the seeds. In a liquid measuring cup or jar, combine the blackberry puree with the vinegar, honey, and olive oil. Whisk vigorously until the mixture is well blended and smooth. Season with salt and paper to taste. Chill until ready to serve. To make the spiced nuts, melt the butter in a medium skillet over medium heat. Stir in the brown sugar, cinnamon, cayenne, and salt and pepper to taste. Allow the mixture to heat for about 1 minute, then stir in the chopped nuts. Let cook, stirring occasionally, until the nuts are lightly toasted, about 5 minutes. Remove from the heat and let cool. wow, this salad looks soooo delicious!!! !